A mix of traditional and bohemian, this living room decor uses faux greenery, neutrals and global accents for year round styling. Waaaay back in August (has it really been that long?! ), I posted about a redesign for our living room. I’ve ‘tweaked’ our living room maybe half a dozen times in the last few years, but I knew it was because I was working around furniture I didn’t really love. Our living room is our gathering place – for conversation, a thrilling movie, or to cuddle when someone is sick. While it was working for that, some things just didn’t function and others made the space feel cluttered. What I really wanted is the space to feel clean, less cluttered, and more curated. 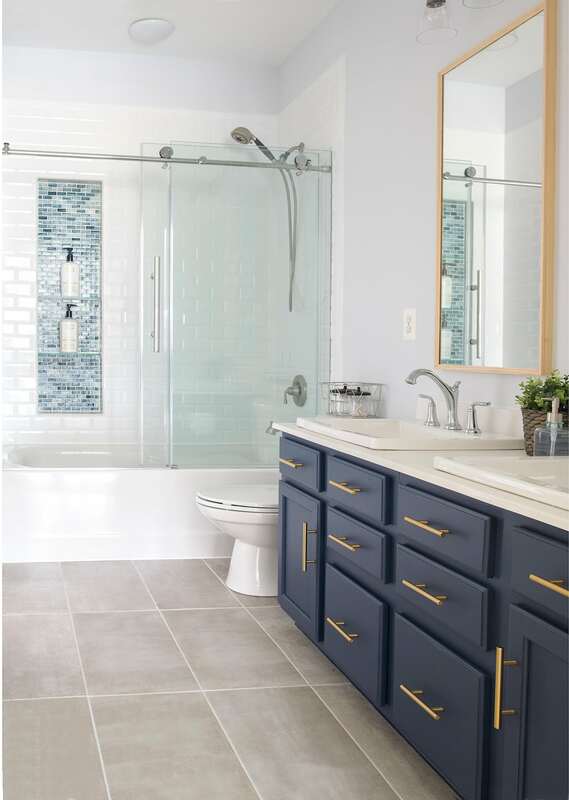 I still wanted patterns and fun, but with a feeling of fresh, simple, and serene. Sources are at the bottom of this post if you are interested. I feel like this photo doesn’t even do the space justice, because it feels more open. The first thing we did was to replace both couches. The former dark couches made the room feel smaller and more closed in, so I went lighter on the main sofa. With our family, no way I could do white or cream colored so I opted for a lighter gray and added white accent chairs. The artwork collage over the sofa is actually a mix of free prints from Upsplash. I used to have a real fiddle leaf fig, but we were total fr-enemies. If I moved the pot, 5 leaves would fall off. Leaves would turn brown no matter what I did or didn’t do. At times, I actually felt a air of patronizing superiority coming from that plant. We were just not meant to be, so I found her a new home (gave her to a friend) and I wish her well. For me, artificial is the way to go. But I mixed in several other hardier houseplants to keep it fresh. 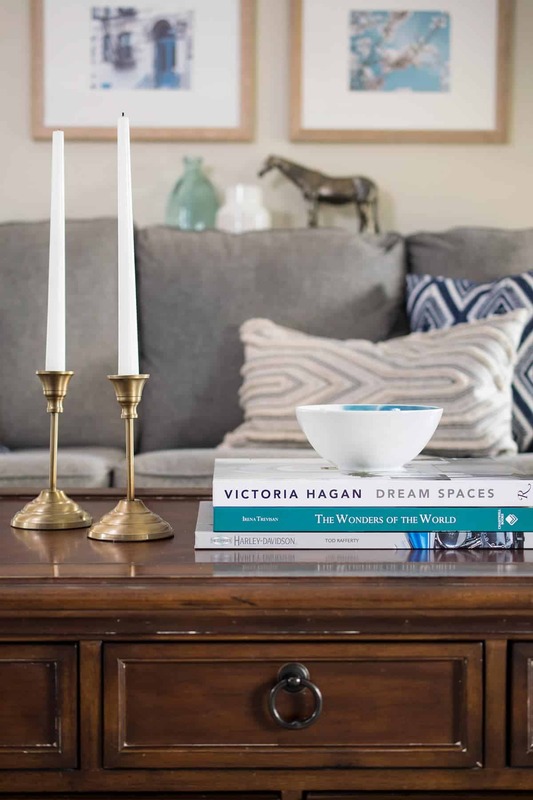 I wanted to keep everything simple this time around and the coffee table uncluttered, so I created scale with large coffee table books and these sleek candlesticks that I love. Just before Christmas, I suddenly decided to add some dimension to the fireplace mantle by adding some trim boxes and a heavier mantle piece. That project might be my favorite new feature. It matches the look of the entertainment center without taking away from it as the focal point. This chair was one of my splurges. Actually, all of the chairs were. The biggest change here was previously I had a beige chair next to a cream entertainment center. I felt that this was an opportunity for color and if I am being honest, I wish this chair was maybe an emerald green, but I absolutely fell in love with that wood trim around the edges. Like most real living rooms, we have to decorate around the TV and speakers. Being immersed in a movie or sporting event is important to the big guy. And that’s what a living room is for anyways – living! 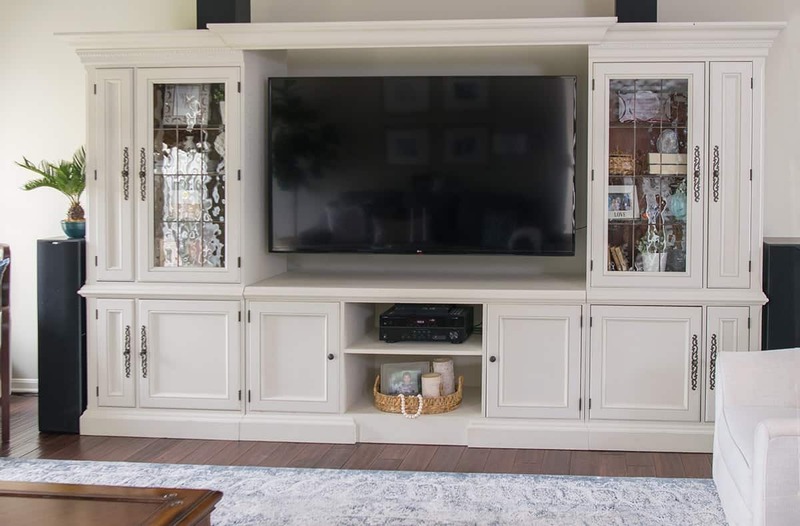 This entertainment center was a thrifty find a few years back, and it could not be more perfect for this room. You can see how we gave it a painted furniture makeover here. One of the big takeaways from this makeover was that I wanted to keep my sentimental items on display. I didn’t want to have to pack something away because it was “the wrong color” or heaven forbid, not trendy. Hello, I would never have kids if that were the case, lol. Not happening. 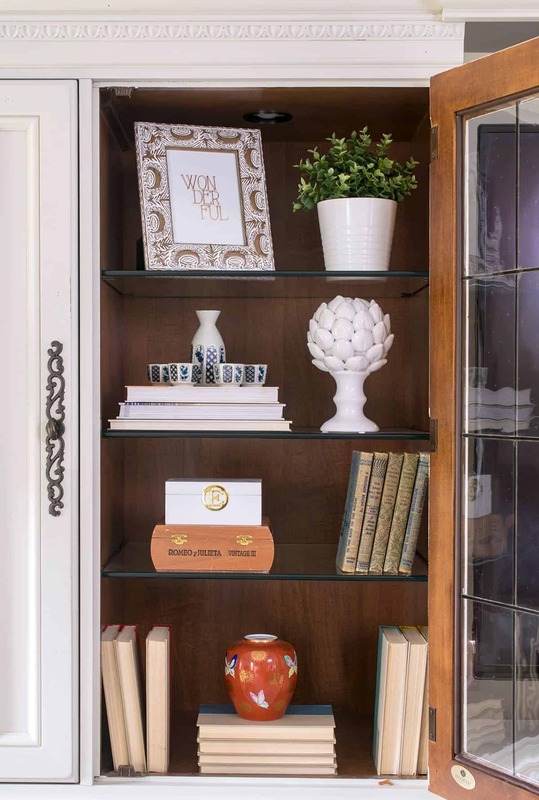 By keeping most of the room natural feeling with neutrals, blues, and fresh greenery, I could display some odds and ends that I truly loved like my grandmother’s Saki set, childhood books, or my husband’s treasured awards. It also doubles as great storage for toys, movie cases, electronics, and other general mess that we need. Mixing traditional furniture with global accents was the overall guiding principle. I am not a matchy-matchy kind of girl, so the global accents brought in enough color and pattern for the room to feel casual. The accent table is one of my favorite unique finds. It’s light to easily move for a vacuum. I still have the wall behind the chairs to do but it’s more of a drop off zone than part of the living room, so I am finally completely happy for now! I can’t believe how much the living room has changed! Everything else was purchased at either Home Goods, Target, At Home, or a personal item. 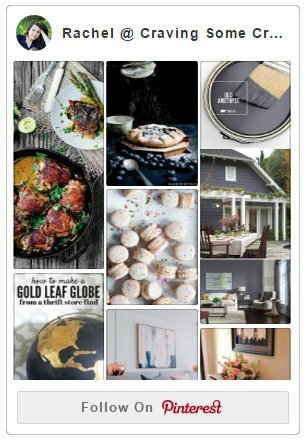 This whole room looks amazing Rachel! So smart to go with neutrals so you can use the things you really love. I think that fireplace is my favorite though. It’s so comfortable and inviting, I bet your family loves being in here. Thank you so much! Overall, everyone likes it. Hubby is a little annoyed that I moved his giant, overstuffed recliner to the basement. I know that the room does flow better without that big thing in the way, plus now he has to sit next to me during movie night! Hi Rachel, I am really inspired by your living room makeover ideas. The painted furniture looks really great and charming. Thank you for the ideas and keep up your good work. Love it Rachel, it looks beautiful. And I have a few plants like your fiddle tree, lol.